With our new "Med Mod" system that puts fresh meds into a separate pocket in the kit at the time of sale, you will no longer run the risk of purchasing a kit with expired meds. This 10 PERSON METAL BASIC KIT contains no gasket and has the new and improved Pocket System with more detailed information on how to treat wounds. 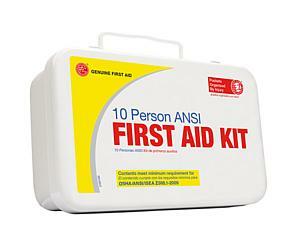 ANSI Basic kit has all the essentials to be ANSI compliant as a TYPE 1 kit.